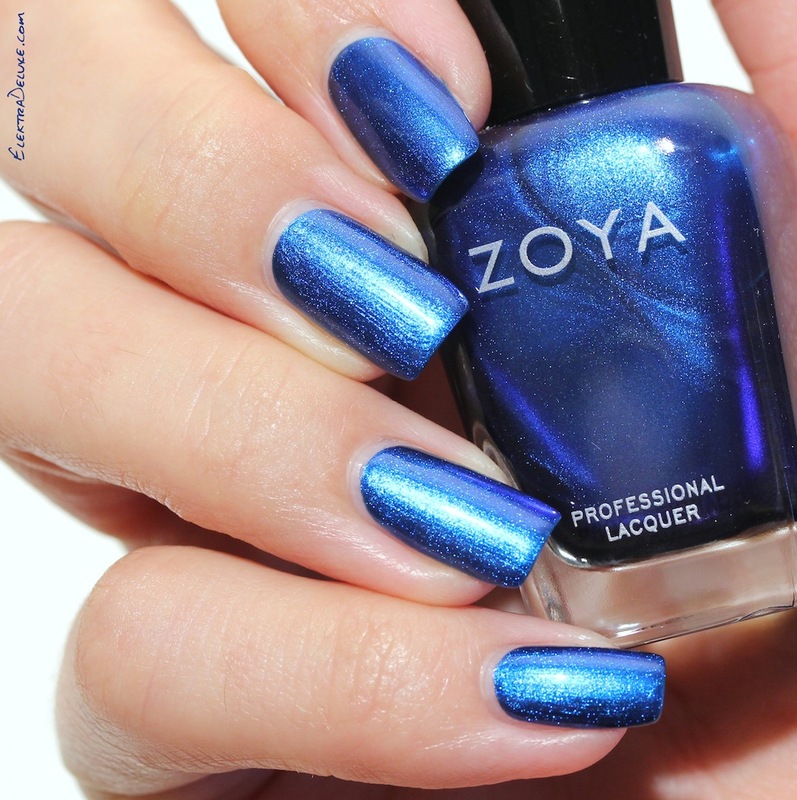 Zoya Estelle is a royal blue shimmer from the Flair Collection. It’s bright and beautiful 🙂 Formula was fine and I applied 2 coats. 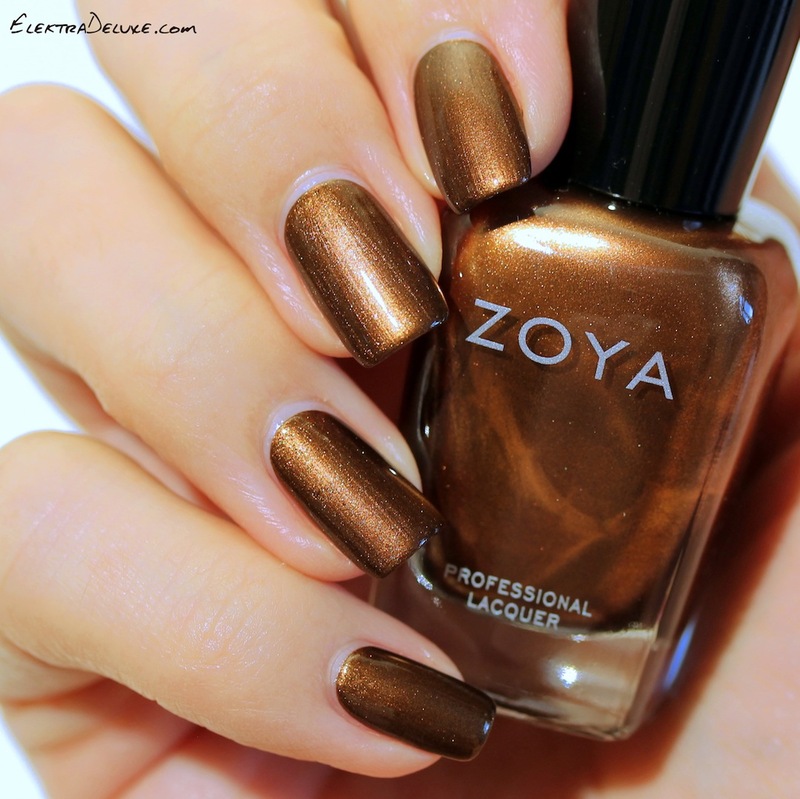 Zoya Cinnamon is a brown shimmer from the Flair Collection. The polish is very unique and I don’t have anything like it in my stash. I adore the polish itself but not so much on my nails unfortunately. You’re looking at 2 easy coats. Zoya Charli is a grayish olive green creme from the Focus Collection. It appears darker on the nails than in the bottle which was a little bit disappointing for me. I would have preferred the polish to be lighter. Formula was flawless though. This is 2 coats. Zoya Remy is a deep greenish blue/teal glass fleck shimmer. It belongs to last year’s Ignite Collection (like Autumn, Sansa and Teigen). I am crazy in love with the look of the polish, BUT it stains like there’s no tomorrow! On some nails I flooded my sidewalls and I couldn’t remove the stain for days. This kind of spoiled the polish for me 😦 Remy is very opaque and covers completely with the first coat. I applied 2 though. Zoya Yuna is a deep greenish gray glass fleck with gold reflections. Like Remy, it’s part of the Ignite Collection. It appears very dark on the nails in most lightings. This is 2 coats. 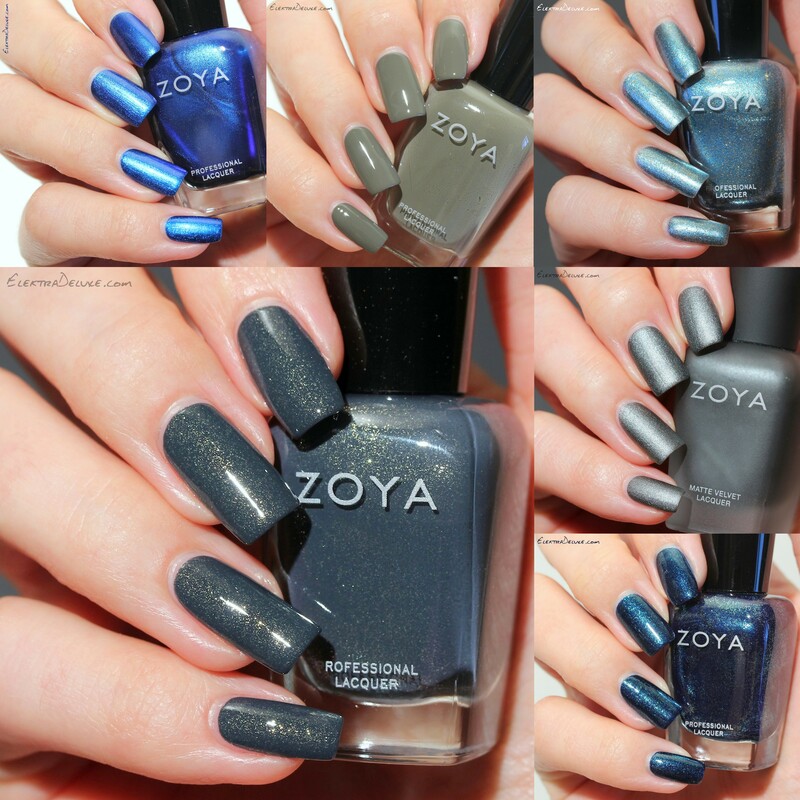 Zoya Loredana is a gray Matte Velvet. As much as I want to love the matte look, I prefer the polish with shiny top coat. It really brings out the shimmer. I applied 2 coats. Zoya Crystal is an icy blue foil with gold glass flecks. It was already released in 2010. Many bloggers raved about this polish, so I decided I just had to have it and it didn’t disappoint! You’re looking at 2 coats.